Los Angeles, California – This was a big year for full-size SUVs. Particularly, with new models like Subaru’s 3-row Ascent we covered from LA last year and VW’s 7-passenger Atlas (reviewed here). So it’s no shocker BMW decided to get in on the action, entering the segment late with the first-ever 2019 X7, making its world debut at the 2018 LA Auto Show today. Though we did get a glimpse of the X7 iPerformance concept last year. …in other words: a full-size luxury SUV with off-roading ambitions. The big Bimmer joins two other larger haulers including the best-selling, brawny mid-size X5 which first arrived in 1999, and the odd X6 mid-size crossover considered by many one of the ugliest vehicles on the market. Smaller options include the X1, X3, and X4 crossovers. 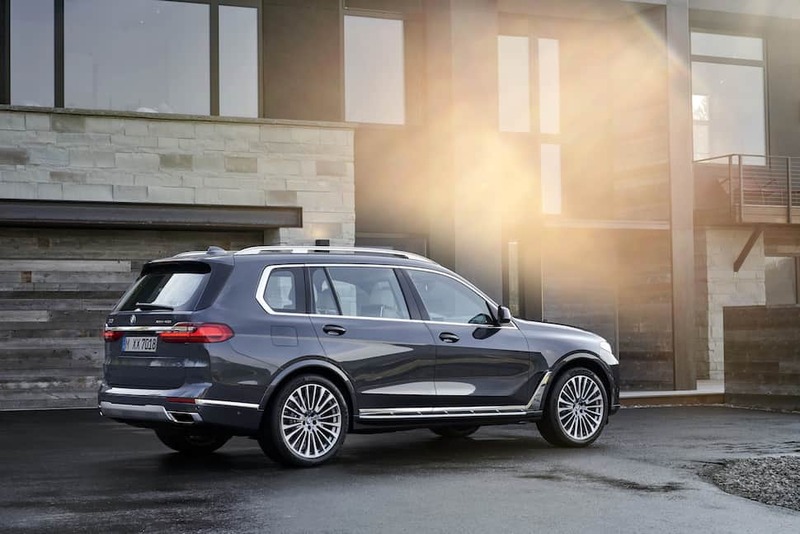 Exterior styling-wise, the X7 looks sharp and sleek, appropriately blending luxury with aggressive features the way only BMW can pull off; the rear design is a bit squared-off with long horizontal lines including wraparound taillights. With a length measuring 5,5150 mm and wheelbase at 3,100 mm, BMW’s latest X model entry is the largest in the series. Some differentiating features include ground clearance on the higher side, a long roofline, and a two-section split tailgate. Wheel options include 21-inch and 22-inch alloy rollers; 20-inch light alloy wheels come standard. Apparently, the luxury X7 flexes its off-road chops too with an xOffroad Package to include specific off-roading driver select modes, specific xDrive and gearbox, two-axle air suspension with lifted ground clearance, off-road differential lock, and a protective underguard up front. The cockpit gets a 3rd-generation HUD that’s both larger and informative. Some standards include the 4-zone automatic climate control (5-zone is optional), ambient lighting (Ambient Air package optional) and 3-section panoramic glass roof up top (Panorama glass roof Sky Lounge optional). Other features you’ll need to pay extra for include controls with glass applications, Bowers & Wilkins Diamond Surround Sound System and Rear-seat entertainment. Built in the US, expect the new X7 to hit dealerships March 2019. We’ll have pricing once officially announced.